*ORDER 2 BOTTLES AND GET 5% OFF! *ORDER 3 OR MORE AND GET 8% OFF! *ORDER 6 OR MORE AND GET 10% OFF! 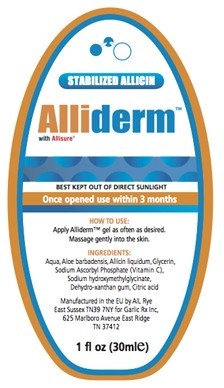 ALLIDERM GEL (1 OZ) - LOWEST PRICE GUARANTEED! Now Alliderm Gel For External, Topical Use! The Awesome Power Of ALLI C In a Convenient Gel! Alli-Derm is a Power-Packed Technology in a Topical Gel. It is Formulated from Stabilized Allicin in a Base of Aloe Vera with Additional Vitamin C.